Whether in the pot or the ground I regularly feed my Passiflora. A complete fertilizer provides all three primary macronutrients and some of the secondary nutrients and micronutrients. Read more. The label of the fertilizer will usually list numbers, for example 7-7-7, 5-10-5 or 6-1-5, which refer to the percent by weight of the primary macronutrients. That is nitrogen, phosphorus & potassium. always in that order N-P-K. Note that confusingly K=potassium, from the Latin Kalium. Even more confusingly worldwide there are variations in how N-P-K is measured. Too much nitrogen gives good leaf growth & few flowers, but is better for smaller plants that you are wanting to get up to size. A stressed plant will flower better than one that is too comfortable, so to some extent you initiate flowering by giving the plant what it does not want. There is conflicting evidence about whether Passiflora may flower better with high phosphate or high potassium fertilisers. There are no definite answers about what your plant may need as there are so many variables. Experimentation is required. Generally I use liquid fertilisers in pots. Miracle Grow all purpose concentrated plant food 6-3-6 plus micronutrients is as good as anything. Plastic pots are fine but better are clay pots with broken bits of pot & sharp sand or coarse grit in the foot to improve drainage. The clay surface is always negatively charged & the plants can more easily pick up the positive ions, such as calcium, potassium, iron & magnesium, off the clay surface. What this means in practice is that the plant’s roots will grow right into the surface of the clay to pick up these ions. You will see this if you transplant a Passiflora out of a clay pot, the roots will have burrowed right into the pot surface. Where I live there is a very heavy layer of clay soil a few feet down, it is noticable that when the bigger Passiflora reach that layer they start to grow really well. Aaron Gilbert from California USA comments however that clay pots are unsuitable for use outdoors there, due to the pots constantly drying out in the heat. Nevertheless broken bits of clay pot can still be put in the base of plastic pots. Plants grown in pots outside over the warmer months are likely to have the nutrients washed out of the soil if there is a lot of rain. 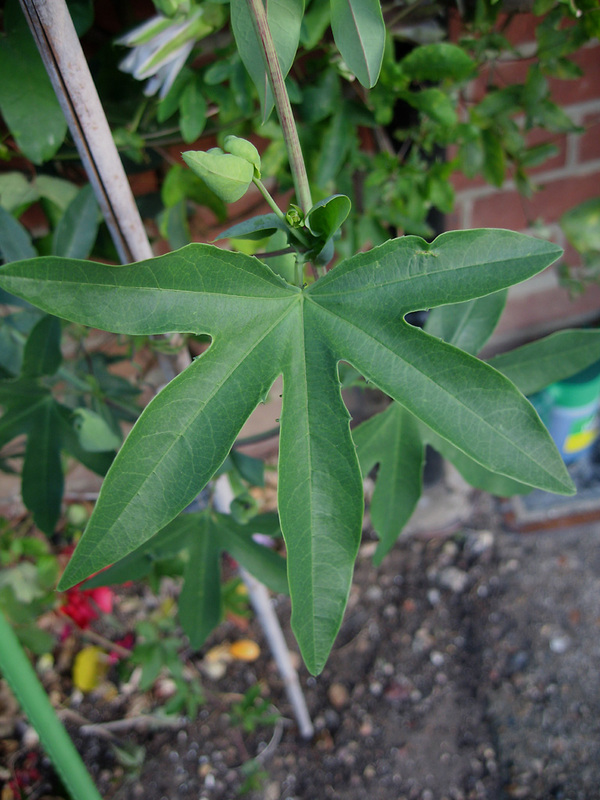 Very large Passiflora plants may need little feeding if they have a large root system & are in fertile soil. Slow release products are best. Recommended are Vitax Q4 (5.3-7.5-10) and Fish, Blood Bone (3-9-3), plus there are many more on the market that will do the job. Organic options are compost, seaweed, banana skins or comfrey leaves left to soak. You can also bury banana skins in the ground. Don’t overthink and overcomplicate matters. As John Vanderplank said these plants are greedy feeders but for most of them any general fertiliser will do with plenty of nitrogen to get them growing and more phosphorus and potassium to get them flowering.